Daniel Brown Law is a criminal defence firm experienced in representing clients charged with serious matters in the Superior Court of Justice and the Ontario Court of Justice in Newmarket and throughout York Region and most of southern Ontario. Our results speak for themselves. 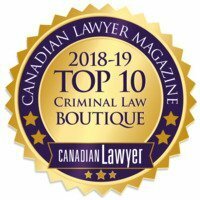 Daniel Brown Law is recognized by Canadian Lawyer Magazine as one of Canada’s top 10 criminal defence firms. Call to schedule a time to meet Daniel Brown at his Vaughan Office location – 8800 Dufferin Street, Suite 301, Vaughan, Ontario L4K 0C5. You can also schedule a time to meet Daniel at his Toronto Office Location. Having an experienced Newmarket criminal lawyer on your side is the best defence. It is the only way to help you achieve the best possible results when facing criminal charges. Daniel Brown is one of just a handful of lawyers in York Region designated as a Criminal Law Specialist. He regularly defends people charged with crimes in Newmarket, Vaughan, Thornhill, Markham, Richmond Hill, Woodbridge and elsewhere in York Region. Daniel Brown is available to work with and along side you through every stage of the criminal court process including bail hearings, trials and appeals for all types of criminal charges. With extensive knowledge of the law and criminal court procedure at the Newmarket courthouse, Daniel Brown can assist in a number of criminal law related areas. Newmarket Criminal Defence Lawyer Daniel Brown regularly represents individuals charged with criminal offences in Newmarket, in particular offences under the Youth Criminal Justice Act, drinking and driving offences, domestic assaults, thefts and fraud as well as offences under the Controlled Drugs and Substances Act. Being accused of a crime can be an extremely stressful experience. Remember, your best defence is hiring the right lawyer to protect your rights. If you are charged with a criminal offence other than a “domestic” related charge (including domestic assault) in York Region, you are required to make your first appearance in Courtroom 205 at the Criminal Courthouse. “First appearance court” is held Tuesday through Friday in Courtroom #205 with accused persons making their first appearance at 10:30 a.m.
Those facing domestic related charges including domestic assault, mischief under $5000, criminal harassment, uttering threats etc will appear on Tuesday or Wednesday morning before a judge in courtroom 102 at 9:30a.m. until a trial date is scheduled. If you or someone you know has been charged with a criminal offense in the Newmarket area, do not delay seeking legal representation. Contact Newmarket criminal lawyer, Daniel Brown at (416) 297-7200 to arrange a consultation to discuss your criminal matter.